Elevator Bolts are wide, flat head countersunk bolts that have a shallow conical bearing surface, an integrally-formed square neck under the head, and a unified thread pitch. They are most commonly used in conveyor systems. 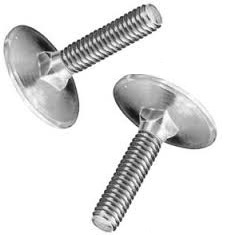 RC Fasteners & Components stocks grade 1, flat, countersunk head elevator bolts in plain and RoHS compliant zinc clear.